Crinums (Crinum spp.) are bulbous, lily-like perennials that grow in tropical and subtropical locations. 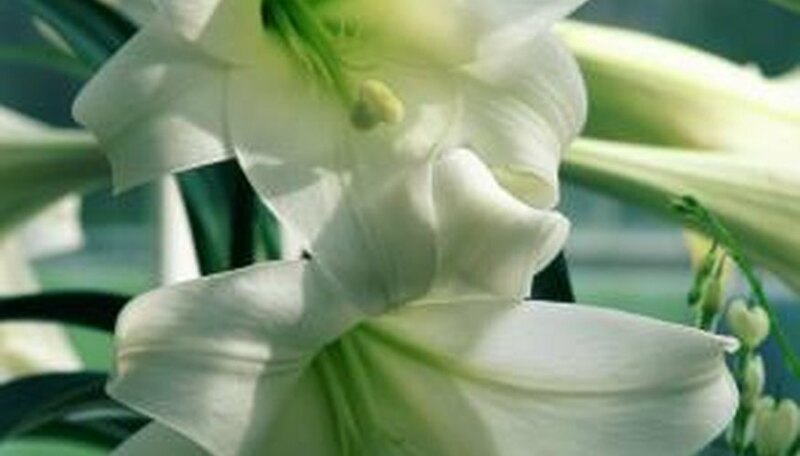 The flowers are large and showy, and range from flowers resembling lilies to flowers that are starry and thin. They produce strap-like, basal leaves but the flower stalk is leafless, and can reach 3 to 5 feet in height. The flowers are usually fragrant and many flowers are produced on a stalk. Crinums grow well in U.S. Department of Agriculture plant hardiness zones 8 through 11. Most white Crinum flowers have at least a tiny hint of pink. A few of the whitest varieties include "White Mogul" (Crinum "White Mogul"), "Catherine" (Crinum Catherine") and "John's Bid" (Crinum "John's Bid). Both "White Mogul" and "Catherine" have white recurved petals, but "John's Bid" has petals that are less curled. Both "Seven Sisters" (Crinum "Seven Sisters") and "Improved Peach Blow" (Crinum "Improved Peach Blow") are pink in bud but open white with slight pink tinges. "Seven Sisters" has slightly thinner petals and little petal curl, while "Improved Peach Blow" exhibits the typical lily form, with slightly curled petal tips. Pale pink is a common color for Crinums. "Spring Joy" (Crinum "Spring Joy") and "Angel's Trumpet" (Crinum "Angel's Trumpet") are pale pink to nearly white, while "Grace Hannibal" (Crinum "Grace Hannibal") and "Pink Flamingo" (Crinum "Pink Flamingo") bear solid light lavender flowers. "International" (Crinum "International") bears light pink flowers with a large white throat, and "T M Howard" (Crinum "T M Howard") sports pale pink flowers with slightly darker pink coloring running down the center of each petal. While pink is a common color for Crinums, the range of pink shades offers a wide selection. "Ellen Bosanquet" (Crinum "Ellen Bosanquet") and "George Harwood" (Crinum "George Harwood") produce flowers that are nearly red, while "Magenta" (Crinum "Magenta") is slightly purplish-pink. Both "Cecil Houdyshel" (Crinum "Cecil Houdyshel") and "Mrs. Horace Kennedy" (Crinum "Mrs. Horace Kennedy") bear medium pink flowers with a strong trumpet shape, while "Mystery" (Crinum "Mystery") has a more open habit and thinner petals. Crinums with bold center stripes are exciting additions to the landscape. "Rose City Star" (Crinum "Rose City Star") produces high-contrast flowers with its bold, magenta stripe edged in white. "William Herbert" (Crinum "William Herbert") bears broad white flowers with recurved petals and a medium pink center stripe, while "Bayou Belle" (Crinum "Bayou Belle") produces thin white petals with a slim, medium pink center line. "Carol Abbott" (Crinum "Carol Abbott") bears white, trumpet-shaped flowers with highly recurved petals and a broad, pink center stripe. Yellow is not a common color for Crinums. However, there are a few that bear pale yellow blooms. The Murray lily (Crinum flaccidum), also called the Andamooka lily, darling lily or stink lily, is native to Australia. It bears white to pale yellow flowers with petals that don't curl back like many lilies. They tend to emit an unpleasant aroma in the evenings. "Yellow Triumph" (Crinum "Yellow Triumph") is a cross of the Murray lily and bears the same pale yellow flowers but with slightly recurved petals. What Does a White Flower or Rose Symbolize?